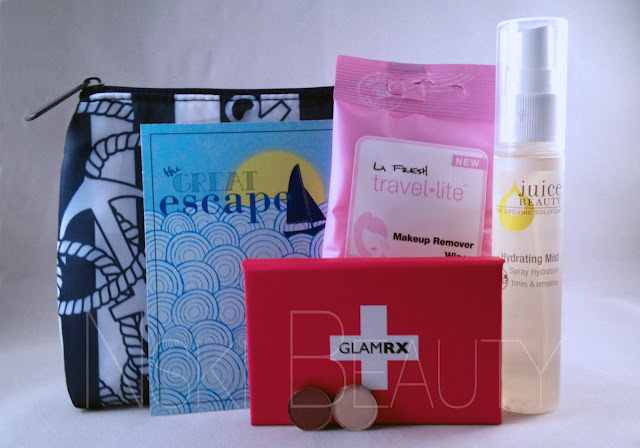 For March's Ipsy bag the theme was "The Great Escape". I adored this month's bag and the theme made me dream of summer now if only it would get here sooner! Out of four possible options in colors I received Azalea Petal & Seashell. I love the Seashell's subtle shimmer and its pigmentation. Azalea Petal would be just as pigmented with a base. This is probably my favorite item in this month's bag! I am always using black eyeshadow to set my eyeliner so it's nice that I have a mini palette I can carry a couple of the shadows I need in my handbag. I also love that the inside has a large mirror to accompany it. I haven't had a chance to test the wipes out just yet so I don't have a full review but I do like that they are travel friendly and are unscented. Can I just say how adorable is this bag?! I think in the 16 months I've been getting Ipsy this is by far my FAVORITE makeup bag I've received! But alas it has been ginger napped by my BFF / Partner In Beauty and our resident Hair How-To girl Jacquelyn Marie as she is OBSESSED with anything & everything nautical.